Welcome to my site. Here you will find some very interesting information about this best-of-ever produced TV-show in New Zealand. And ofcourse this site would not be complete without info about our blessed and talented leading actress : Lucy Lawless. I've been fan of the series, although living in Europe, from the very beginning thanks to some very good friends abroad. Because I've been interested in New Zealand since I was a child, I went to that paradise on earth during my honeymoon in 2007. Logging with Trudy and John Bethells-Pierce was a unique experience. This show was filmed on their property. So we were perfect located to get full info and visit all those beautiful filming places aswell. I won't tell you more but leave it upto you to discover it yourselves by browsing through my pages. You will become enchanted by New Zealand. I started this site in 2005 but due to his unique name it was captured away. I started over another site Loyaltoxena.com. After a long struggle to get back what was rightfully mine I finally succeeded. All the info regarding Xena Warrior Princess show, Lucy Lawless, New Zealand and the Xena filmlocations will be uploaded and splitt over both. To guide you through both sites just use the menubar and you will get where you want to be. It is all kept there for you. "TIP" This site is best viewed in a high resolution. Enjoy Xena, Lucy Lawless and New Zealand. 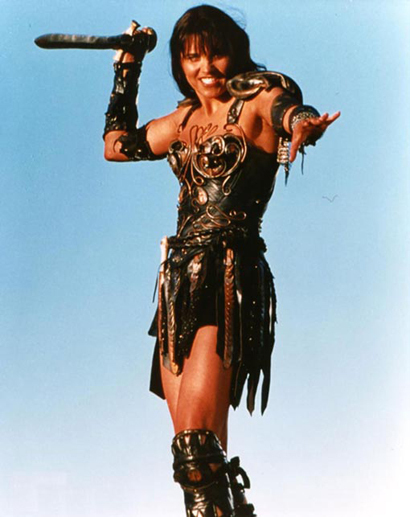 She was Xena, A mighty princess, forced in the heat of the battle. Together with her 'partner' Gabrielle, Xena lives for ever. That's immortality.